Does anyone remember a magazine from the 70’s called “Sphere?” It was a Betty Crocker magazine, but more on the gourmet side. 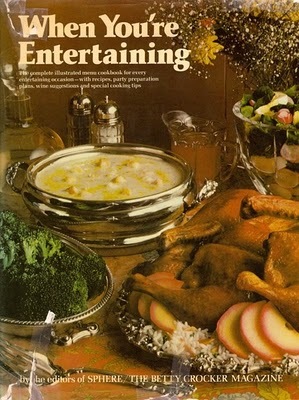 It had fabulous recipes, many of which I still use today. Not only that, they had amazing photos, decorating ideas, a very unusual wedding cake, and even patterns for clothing. My mother, who is an expert seamstress, made me one of my favorite dresses I have ever had from one of the issues. I think of it now and it looked very Diane von Furstenberg. My daughters would be proud to wear it now, even though it would be from almost 40 years ago. I wish I had it. I can still remember my Mom and I looking forward to every issue and ooohing and aaahing over everything. If I remember correctly, the first issue must have been around 1972. It was originally called, “Sphere, The Betty Crocker Magazine,” then later just called “Sphere,” then even later called “Sphere Cuisine.” Sometime in the early 80’s, it became “Cuisine” magazine, which is still published today, and which I also love. But how I miss the old Sphere. I don’t think any magazine has ever excited me as much, and how I wish I still had the past issues. But fear not, as Betty Crocker published two cookbooks, one called, “When You’re Entertaining,” and the other, “When You’re Entertaining Internationally.” They both contain hundreds of recipes from the magazines. “When You’re Entertaining” is divided into nine chapters, with each chapter covering different kinds of parties. Each menu includes a time schedule that tells in outline form, exactly when to prepare each recipe so everything is ready on time. Some of the parties include a gourmet picnic , a summer salad luncheon, a Christmas buffet, a down-on-the-farm brunch , a fish grill, and dining Southern style. 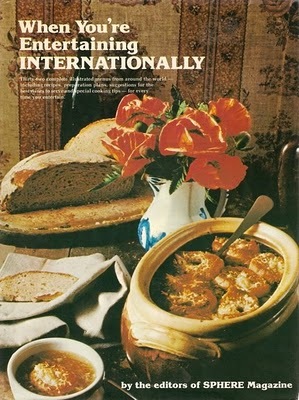 “When You’re Entertaining Internationally” has the exact same set-up as the previous cookbook except with an emphasis on authentic foods from around the world. Not only is there beautiful food photography, but also photos of the countries and regions where the foods originated. The thirty-two full-course menus range from far-away places like the South Sea Islands, to the old Spanish-style cooking of closer-to-home St. Augustine, Florida. Enticing titles such as a Nova Scotian Christmas, an Argentine fiesta barbecue, a Tunisian temptation, a Finnish coffee table, a British sweet trolley, or a Mayan meal, make you want to plan a party every weekend. Both books also offer wine selections from internationally recognized wine expert, Paul Kovi, who was a partner in the famed Four Seasons restaurant in New York City. I found a special surprise in the International cookbook. Stuck between the pages was a yellowed sheet of paper with a handwritten recipe for liver dumplings to serve with soup. The writer even had a tip on making the dumplings the perfect size: “Just remember to dip the spoon first into the boiling soup, then the mixture sticks to the spoon less. Also, dip the spoon between each spoonful. Good luck!” This is what I love about collecting old cookbooks; you never know what will be written inside in the columns or a carefully written recipe on a piece of paper. I have some old cookbooks with notations such as, Grandpa loved this! or, don’t make this again; or my favorite – my dog wouldn’t eat this! Now I only wish someone had included the pattern for that incredible dress. 65 Responses to Oh, Sphere, Where Art Thou? My sisters and I just found a large collection of this sphere magazine in our aunt’s basement. You and your sisters are in for a treat! Tell me more – how many issues and what years?! What a treasure! Enjoy! Off and on for several years I have searched and searched for a recipe from an old issue of Sphere. I was a subscriber from its inception and kept every issue. The issue I am especially interested in contained a variety of Christmas cookies, one being a spicy cookie shaped like a mushroom – no, it was not meringue. I kept all the issues until some were damaged by water in my basement. Someone threw all of them out before I could rescue the dry issues. Does anyone here recall or have the recipe for a cookie that was not only delicious but the hit of any gathering? Hello, anonymous! I am almost certain I have that recipe! I remember those cookies well. I will have to search my files, and I will get back to you as soon as I can. But I will need your email address so I can send you the recipe! Just write me at debbievanni@aol.com or culinarycellar@aol.com and put mushroom cookie in the subject line so I will know it’s not spam. I had the same problem years ago with a flooded basement and losing magazines, some being Sphere and many old Gourmets, so I feel for you! I hope to hear from you soon. Debbie…… Bless your heart! I never expected to locate the recipe. Email is on the way. I love finding Sphere fans! Now I have to go see if I have that issue of Abigail Adams’ recipes. Sigh.. I still miss it, too. Dear Anonymous. I have the mushroom cookie recipe. It is in the Dec 1972 issue. it’s called Lithuanian Grybai (Mushroom Cookie). i’d be happy to scan and email it to you if you like. Hi Kathleen! I would love to have the mushroom cookie recipe. I found one that used almond paste. If yours doesn’t have the almond paste, then I don’t have that issue. I would love it if you could scan it and email to: culinarycellar@aol.com I hope anonymous sees your comment and writes back. Sphere readers are the best! I’ve been looking for a Sphere recipe also. It’s called Sourdough Chocolate Mocha Cake. It’s baked in a bundt pan. I can still remember how it tastes, but we lost the recipe long ago. If anyone has it – how can I get it? And thank you! Hi Jann- I am going to look through my files and old Spheres, plus I have a friend who has many of the magazines. If we find it, or someone reading this finds it, we’ll get back to you! I am so glad to have found this site. I too am looking for a recipe from an old Sphere magazine. It was from a November issue (in the mid seventies) and ihe recipe was for a pecan pumpkin pudding. It was pictured as a rounded mold on a platter, decorated with pecans and served with a warm vanilla sauce. It was fabulous! I had made it several times and can no longer find the magazine. Hi Janice! I am so happy you wrote. There are so many of us Sphere lovers out there! I remember the pumpkin pudding you are talking about. I don’t have that issue, but lots of my Sphere recipes were clipped out years ago and filed away or put on recipe cards. I have been looking for the past half hour, but no luck yet. If I find it, I will email it to you ASAP! I don’t have your email address, so if you would like to send it to me directly, write me at culinarycellar@aol.com, or you can post it here as another comment. It’s up to you. I get so many Sphere lovers writing to me, that I think I should write Betty Crocker and tell them how much Sphere is still loved and see if they would send me requested recipes! I have one myself I can’t find for a carrot-orange marmalade. In the meantime, I’ll keep searching for yours! We are looking for a recipe from the October 1976 issue of Sphere The Betty Crocker Magazine. The recipe was for Spicy Wheat Snaps. Delicious! Our old recipe is torn and we are unable to read all the ingredients. Can you help us? Hi Tony and Sara! As always, I will do my best to find recipe requests, and get back to you if I find it, or if someone out there has the October ’76 issue, they will let us know. I’ll write back to you if I find it! I know what it’s like to have worn out cards that are no longer legible, and it’s worse when it’s a favorite recipe. Thanks for writing! I loved reading this post and comments, it brings back a lot of memories! My most vivid memory of Sphere is not the food, but a particular issue that featured stencils in Japanese patterns to use on pillows etc. I made those pillows and wish I still had them. The entire issue was one of my favorites. Wish I had the issue, too! I’ll keep checking ebay. One comment though – I don’t think the Cuisine magazine that is published today is the same one from the past. I seem to recall they ceased publication for many years. When the new Cuisine came out I was very excited, but read online that it wasn’t the same company. Hi Suzanne- I remember those stencils! Maybe someone out there will know which issue it is. My mom and I used to make so many of their craft items and clothing. You are right about the Cuisine today is not the same as the one way back when; it’s just the same name. I hope you find the issue someday with the stencils! Thanks for writing. I was so thrilled when I opened my email today. Some one sent me the recipe for an apple pie that I use to make from the Sphere magazine October 1976. My dad’s favorite and he still talks about that recipe. Yippee!! I am so happy for you! If you would like to send me the recipe when you have time, I will post it for all Sphere fans to see. Thank you so much for writing! I am on the hunt for the wedding cake recipe from the September 1972 issue…the pound cake and date bar layers with the coffee buttercream frosting, apricot filling and meringue mushrooms…Does anyone have it? I made that recipe for a friend’s wedding in a woods-filled park! I remember staying up all hours making those mushrooms! It was delicious! I see Debbie has found the recipe for you. Rachael! I happen to have this recipe, and it’s one of my favorites! I will send you a separate email. I thought I’d follow up and let you know that I obtained a copy of the Sphere with the Japanese pillows! It was June of 78. I scored a 5 year collection of Sphere magazines and it’s been so much fun looking through them. The pillows were nicer than I remember. It’s too bad I can’t say the same about the food, lol. All of those issues – cram packed with so much BROWN food! Meat, fat, pasta, bread, potatoes, and brown sauces. I’ve not run across a thing I’d cook yet but I’m still looking 🙂 It’s still been fun, though. The fashion was a hoot and the advertisements were of so many familiar items. Hi Suzanne – I remember those lovely pillows! Lucky you to find a 5-year collection! I’m sure those looking for the recipes would love it if you had them. I know that some Sphere lovers have been looking for some recipes for a long time. Thanks for writing and enjoy your wonderful collection! Dear Rachael – I found the wedding cake recipe and just sent you an email, or maybe someone here already beat me to it! Either way, have fun with the cake – it’s amazing! The recipe that Rachael was looking for is the one I think I too have been hunting for. I made it when I first got the magazine, but alas found a lot of my old Sphere magazines, but not that one. It was a 4-layer cake and you had to freeze some of layers before you could assemble. One of the ingredients was cherry herring liquor. There was also almonds and the merinque mushrooms dusted with cocoa. Please send it to me if you can. It was a beautiful cake and I want to try to make it again. Thank you. Dear Anonymous – I would love to send the wedding cake recipe to you, but I have no email address or contact information! If you don’t want to post your email address here, just write me at culinarycellar@aol.com – and put something in the subject title like Sphere wedding cake just in case it goes to spam. I would love to help you! I haven’t taken time to take out my back copies of Sphere, they are stashed away, but a recipe I’ve made over the years is Encore Country Ham Bake which seems to be a variation on a southern recipe of ham and corn baked in a soft cornbread. My mother-in-law subscribed for me and herself. I looked forward to each issue for recipes, patterns and home ideas. Another Sphere lover! I love hearing from you all and what recipes you have made over the years. The ham bake sounds yummy! @ Anonymous January 12, 2011 4:51 PM: i would love that apple pie recipe! I am looking for a recipe from Sphere for a coffee cake that was yeast based, formed into a ring and filled with ground almonds, chopped pecans, vanilla wafers, white sugar and currants soaked in cognac. The dough and filling were then rolled up, the ends joined together and then cut into 1 inch sections which were then folded out to make a ring I had kept the copy which I think was from the late 70’s for years but lost it in a house move. Can anyone recall it – I think it was in a Thanksgiving issue but I always made for my family for Christmas brunch. I am looking for your recipe, although I am missing a couple November issues. I will keep searching and do my best to find it. I have no way of reaching you except through here, or you can write to me directly at culinarycellar@aol.com. I would love to find the recipe, too. It sounds delicious! Thanks, Anonymous. I went to the link you provided but couldn’t find the old Cuisine’s from the ’70’s and ’80’s, and no Spheres at all. How did you find how to buy the old ones? Maybe I am looking in the wrong area. Hi Linda- So happy you found this Sphere-lovers blog! It never ceases to amaze me how many people have never forgotten that great magazine. I believe I have the mushroom cookie recipe you are looking for, but I don’t have an email address to send it to you. If you write back to me at culinarycellar@aol.com I will email the recipe to you. Put something like Sphere mushroom cookie recipe in the subject line so I’ll know it’s you. If there are any other recipes you may remember, I can try to find those, too. Thanks for writing! Hope to hear from you. What a GREAT magazine it was!! I passed a Sphere magazine to a co-worker years ago. She then became ill and did not return to work. I hated to pester her family for the magazine when she was so ill.
Needless to say, I never got my magazine back and so lost one of my favorite recipes! I would LOVE to have the Sphere recipe for a triple layer chocolate cake with chocolate icing – I used to make it quite often! I would LOVE to send you the cake recipe you are looking for, but I need your email address! If a comment is entered as “anonymous” I have no way of reaching you. Send me a personal email to culinarycellar@aol.com and put “Sphere recipe” in the subject line. I will do a search for your cake recipe in my Sphere issues (I am only missing 2 issues- August ’72 and November ’73) so most likely I will find your recipe. I hope to hear from you soon! i lOVED this magazine as a child, and my dream was to have the “mushroom hippie” wedding – dress, cake and all when i got married. i think my mom still has the dress pattern for that wedding dress. ha. thanks for telling about the 2 cookbooks–i just found both available through ABE books site and ordered them. what fun that will be! I also wanted the “mushroom hippie” wedding, Melody! However, we did get married in a redwood forest near San Francisco, but I didn’t have the dress or cake from the magazine. You will LOVE the cookbooks! So happy you found them. I loved all the recipes I made from Sphere and Cuisine. I can’t find the recipe for a Christmas cake. I think it was in Cuisine and I think it was an Australian recipe. The cake had a ring of almond paste around the cake. It was baked in a tube pan. I can’t find the recipe and would love to make it. Does anyone remember this cake? What a delightful surprise to find this website. There was a wedding cake in an issue in 1977, I think, it was called a raspberry waltz cake. Layers of genoise, buttercream, raspberry puree and almond pastry. I had the recipe for many years but now I can’t find it. I had done it for my daughters wedding and now would like to do it for her 25th wedding anniversary. If anyone has that recipe or knows which issue it was in, I would appreciate it so much. Thanks. Hi-So happy to find this site. I am searching for a new potato/carrot with thyme side dish recipe that was parboiled then baked. Hope you can help me out! I remember ‘Sphere’ fondly and still use some of those recipes. Has it ever been indexed, do you know? I ask because I should very much like to read again an article they published on Japanese tea ceremony, an anecdote about a broken tea bowl and the lesson of pride and humility a tea master taught a powerful samurai. I demonstrate tea ceremony and would like to tell this story but cannot remember the particulars and don’t want to misrepresent it. If any of your readers have this issue and/or know this article, I should be grateful to read the story again so I might bring it to a new group of tea ceremony students. Many thanks for publishing your site and for any help you or your readers might be able to provide. I would be happy to try and find the tea ceremony article for you. Do you happen to remember what year it was, or maybe what was on the cover? If I find it, I’ll write back to you right away. It sounds very interesting! I apologise for the tardy reply. And thank you for the prompt response and offer to research the article for me. I hope that gives you a time frame for a search and regret I cannot be more specific. Many thanks for your offer and willingness to find this this and good luck. I look forward to hearing from, one way or another and whenever you have time, of course. It had to be from an issue in the late seventies and a fall or winter issue. Thanks for writing, Inge. I will do my best to find the recipe and get back to you! I am desparately looking for a recipe that appeared in Sphere magazine in March, 1978 for sausage and artichoke pie! Can you possibly help me? I emailed the recipe to you, Emily! Thanks for writing. Have been looking for three Sphere recipes for years…Cantaloupe Syrup and two rolled sugar cookie recipes (one with lemon zest and one with spices.) I think they were in an issue close to 1976. Someone just threw my issues away and I cried! I would cry, too, Penni! I’ll do my best to find your requests! Have you had any luck finding these recipes??? I would like to purchase some of these old issues…do you know where I might find them? Penni, I just sent you an email. I found your recipes just last night! As far as finding old issues, you can find some on ebay or Amazon although some are expensive. Or if you get really lucky, you can find them in resale shops or used bookstores. They are not that easy to find. The only reason I have been able to collect all the issues is because a few of my wonderful readers found old issues in their attics and basements and didn’t want them anymore and they found my blog. I am so grateful to them! I treasure my Sphere’s and I know there are many readers out there who are happy that I can send them their beloved recipes that they lost over the years. Finding old Sphere recipes for my readers is my favorite job! I am soooo excited about those recipes!!!!! I have been looking for them, or the magazines, for years! I have a recipe my grandmother made for me when I came home on leave. I have a copy of the recipe but am looking for the book. Listed are “Crisp Corn Drumsticks (page 30? )…Chicken Alfredo and a recipe by a Kelly Mrozek on same page. I think page 31 has Cheese Sauce for Chicken Breast, Roasted Chicken with Chutney and a Chicken w/ Herbs/Mediterranean ….which book might have this? I am interested in the whole book. Hi Adam – The issue you are looking for is the Sphere from February 1976. You are right about the Crispy Corn Drumsticks being on page 30, along with the Chicken Breasts Alfredo recipe. The Kelly Mrozek recipe is the Kids Cook page for a Valentine Gelatin Mold. The Roast Chicken with Chutney Dressing and Chicken with Herbs Mediterranean are both on page 56; and the Chicken with Cheese Sauce Lyonnaise is on page 57. It’s a very nice issue. I wish I had a copy to give you, but maybe you can find one online. If there are other recipes you remember but don’t have a copy, I will be happy to scan any for you. Hello. Does anyone remember a cheesecake recipe that had a sour cream layer on top and a raspberry sauce? My mom isn’t exactly sure if it was from Sphere or not, but is desperately looking for the recipe. Any help would be appreciated. Thank you in advance. I’ll do some checking in my Sphere’s and get back to you if I find one that sounds promising. Good luck in your search! I had to give away my Sphere and Cuisine collection when I moved overseas. Broke my heart but you gotta do what you gotta do. I’ve been wishing for a coffee souffle recipe I used to make. It had a sauce of melted coffee ice cream. Does anyone have it? Trudy, I think I found your recipe! Watch your email later and I’ll be sending what I found.